An indie game by an experienced developer, who has worked on such productions as End of Nations, Tiger Woods, and NFL Street. In Axiom Verge you play as a man called Trace, who dies and is reborn in a fantasy world, where futuristic and archaic technologies blend. 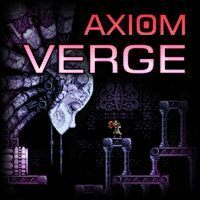 Axiom Verge for PC, PSV and etc. is a game by Tom Happ, a programmer and graphic designer known from such productions as End of Nations, Tiger Woods, and NFL Street. The game is his solo project, created in his free time; all of its elements — mechanics, visuals, music, and sound — were made solely by Happ. You play as a man called Trace, who dies from a fatal wound. He is, however, reborn is a mysterious world, blending futuristic and archaic technology. Trace quickly asserts that the new environment and the being inhabiting it are hostile towards him and are trying to kill him. Not having much of a choice, he begins to fight to survive and decided to solve the mystery of this enigmatic place. The gameplay is based on the most popular platform games from the SNES golden age. The protagonist explores locations full of traps and foes, runs, jumps, and shoots with a gun. The game also features boss enemies. There are over 20 weapons to choose from, such as an electric rifle and a plasma grenade launcher. Apart from that, you can collect over 60 modifications, which upgrade Trace's skills. Finding many of them, however, requires in-depth exploration. Axion Verge features 2D visuals, and its style resembles that of such games as the original Castlevania. The location and character designs are quite dark. The fitting soundtrack is dominated by unsettling 16-bit sounds. The game can be completed in about 8 hours.